This Medieval themed slot machine offers an impressive max jackpot prize of 120,000 coins… not bad for just one spin of the reels. Don’t worry if you don’t net the jackpot though there’s still free spins to be won thanks to the scatter and not one but two multipliers to help skyrocket those winnings! 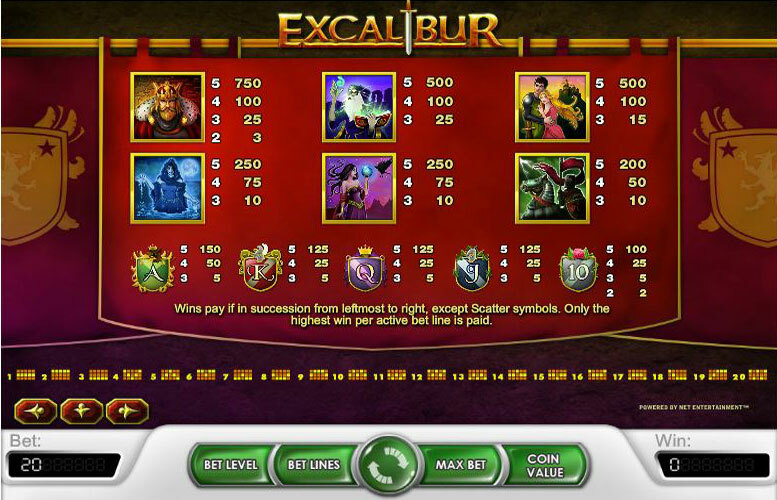 Excalibur is a 5 reel and 20 pay line slot machine game from NetEnt. The graphics are quite dark and have a very gothic/medieval feel which is an interesting contrast when compared to most other slot games. A scatter, golden scatter and wild are present, providing extra ways to win big, and the top jackpot is 120,000 coins. Scatter wins are multiplied and 3 or more scatter symbols starts to trigger rounds of free spins. The return to player percentage is listed as 96.60% which is just above average and the betting limits range from 0.01 coins to 1.0. Obviously total bet amount depends on how many pay lines you decide to play. The maximum jackpot for this game is 120,000 coins. This is pretty average when compared to other games but is not surprising since betting levels can be set quite quite low and good wins are available via the scatter which, as mentioned above, triggers free spin rounds. Outside the top jackpot you will need to enter into the free spin round to have the best chance of netting a big pay day. There are also multipliers that can be applied during regular play which make it easier to win jackpot level prizes. Since these appear on the center reel, you do not need to enable extra pay lines in order to maintain your chances of these symbols appearing. You can bet anywhere from 0.01 to 1 on any given line, choose from 4 different pay levels and 20 different paylines making the maximum bet possible per spin 80 and the minimum 0.01. Remember multipliers are also set based on your betting level, so they will affect how high your prizes will be during any bonus rounds that occur during your turn or free spins. If you’re betting smaller amounts then the max jackpot will be reduced. 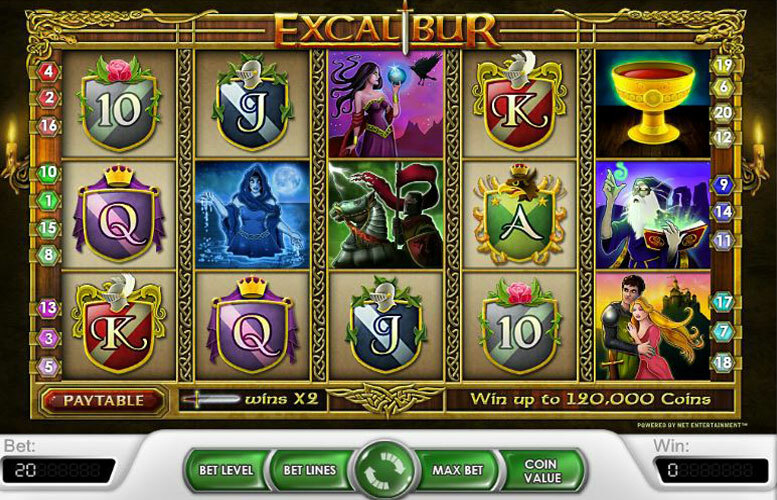 Excalibur Sword – The sword acts as a multiplier and a substitute for the game. When it is used to complete a match, the player gets double the winnings for that particular pair. The Excalibur Sword will not replace the gold chalice to enter the player into the free spin round. 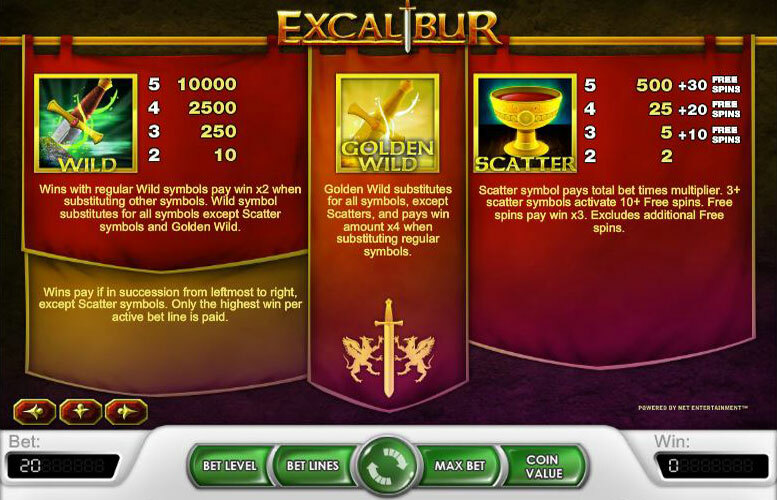 Gold Excalibur Sword – This is another multiplier and substitute symbol on the board. It only appears on the third reel. When it is used to complete a match it will multiply the winnings by four. It will not replace the gold chalice to start the free spin round. Gold Chalice – This is a scatter which will rearrange the symbols on the board to increase the chance of making winning combinations. This can appear on any of the five reels. When three or more chalices appear the player will enter into the free spin bonus round where the player will be awarded a random amount of free spins. All controls will be disabled at this time. No multiplier will be applied to the winnings in this round. Arthur and Guinevere – can appear on any of the reels which will allow the player to match them for basic coin winnings; 15, 100 or 500. Lady of the Lake – is part of regular play and will appear on all of the rows. It can be combined in 3-5 matches to earn coins of 10, 75 and 250. Black Knight – will appear on all 5 reels and pays 10, 50 or 200. Fortune Teller – pays slightly better than the Black Night at 10, 75 and 250. Merlin – this is the second highest paying regular icon at 25, 100 or 500. King Arthur – the top paying icon at 3, 25, 100 or 750. Cards – Ten through ace are available throughout regular play. These will appear on any of the reels and can be combined to make matches which allow the player to pick up coins. All regular symbols can be combined across rows to make the necessary matches. This game has a rating of 3 / 5 with 274 total reviews by the users.